Flora Duffy’s global fame has increased since finishing the triathlon season as the world champ. 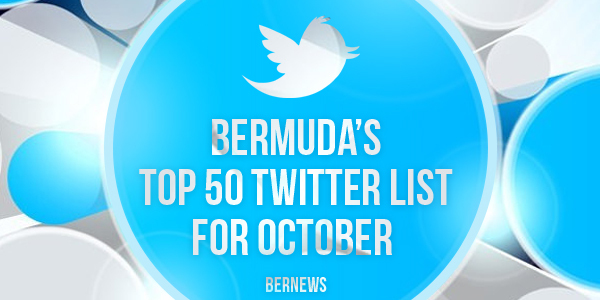 Duffy had the biggest jump in the Bermuda Top 50 Twitter rankings since it has moved to a quarterly posting cycle. In July, Duffy was ranked 32nd but with an additional 1,000 followers she has moved up to 32nd overall. Huddersfield Town forward Nahki Wells leapfrogged Fiyah Marshall and Webster Butler to claim the 8th spot with 27,064 followers. WWE and Fox Business commentator John Layfield added 9,000 followers and now has more than 722,000 who follow his tweets to remain an overwhelming number one. The America’s Cup is moving closer to the 100,000 follower mark and could reach it when the January 2017 rankings are released. The rest of the top six include: Don Burgess, reggae singer Collie Buddz, Ledrew Fox and Oracle Team USA. Entertainer Ray Pasnen joined the list at #28 with 7,114 followers. The numbers for this report were taken on October 1. If you have a Twitter following of more than 3,400 and were not on this list, please e-mail Don Burgess at dburgesspb@gmail.com.